Connect an iPod Music Player to a Home Stereo system. iPod music players are small and portable and typically listened to via an earpiece but when at home why not take advantage of a full-sized audio system for richer sound. iPods have a stereo jack for the earpiece so all you need is an adapter cable to fit into your audio system at home. This cable has the iPod plug at one end which fits into the iPod jack and two stereo RCA plugs at the other end to fit into your input jacks on your full-sized audio system. o Apple iPod Music Player. o Home Stereo audio system. 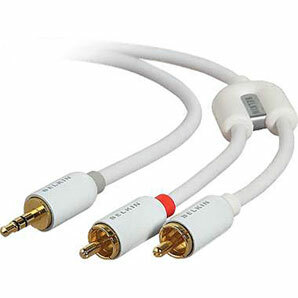 o Audio cable - Y adapter 1/8 inch stereo plug to 2-channel RCA connectors. **Available at Radio Shack for $7.99 Part number is 42-2483. You want to play your iPod music on your home stereo system and use your large loudspeakers and amplified audio. o Play music on your home stereo from the iPod. Audio is via the Receiver loud speakers. Audio 'Y' adapter stereo cable from iPod earphone jack or line-out jack to stereo system AUX IN / CD IN / Audio input jack. Turn on your Stereo system and iPod Player. Select your song and PLAY on your iPod. 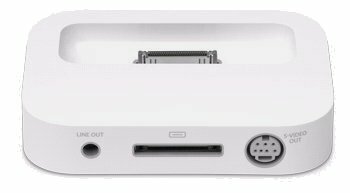 Select on your home system, the correct input jacks where the iPod is connected. Adjust volume level on iPod and/or Stereo system to desired level. Component-style home stereo systems typically include a receiver (which offers a preamp/amplifier with a volume control, and a tuner to receive AM and FM radio). 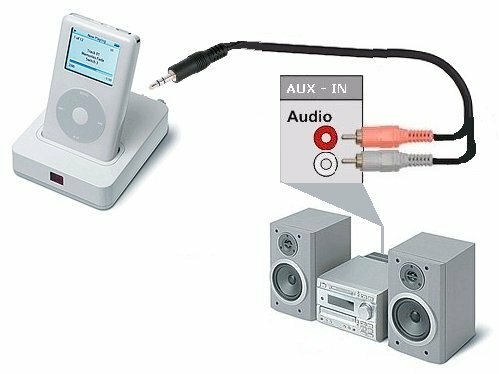 To find a port to connect your iPod to a home stereo, look for RCA-type connections that are marked AUX IN (for auxiliary input), CD IN (for connecting a CD player), or TAPE IN (for tape deck input). All-in-one stereos and boom boxes that are all one piece typically don't have connections for audio input, although there are exceptions - look at the back and sides of the unit for any RCA-type connections. You can connect the RCA plugs (typically red) for the right channel, and one (typically white) for the left channel. All you need is a cable with a stereo mini-plug on one end, and RCA-type connectors on the other, as shown above. Stereo 1/8 inch mini-plugs have two bands on the plug, but a mono mini-plug has only one band. Make sure to get a plug with two bands for stereo sound. Connect the 1/8 inch stereo mini-plug to the iPod dock line-out connection, or to the headphone connection on the top of the iPod. 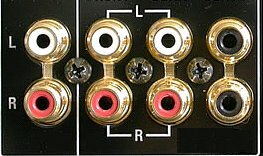 Connect the left and right RCA connectors to the stereo system's audio input, such as AUX IN (for auxiliary input); TAPE IN (for tape deck input); or CD IN (for CD player input). Don't use the PHONO INPUT connection if you have one on your system. This jack is for Phonograph/Turntable input only. These connections aren't properly matched for other kinds of input device's signal levels. You can control the volume from the iPod by using the scroll wheel, or from an iPod shuffle by using the volume control. This controls the volume of the signal from the iPod. Stereo systems typically have their own volume control to raise or lower the volume of the amplified speakers. For optimal sound quality when using a home stereo, set the iPod volume at less than half the maximum output and adjust your listening volume by using your stereo system controls. By doing this, you prevent over-amplification, which can cause distortion and reduce audio quality.